Sweet and spicy. Hot and cold. sweet and savory. Crunchy and chewy. This dish is full of delicious contradictions. 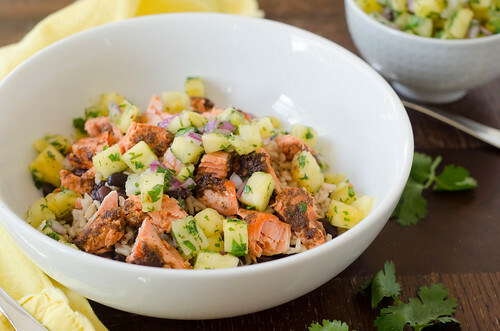 You start with a combo of brown rice and black beans, then top it with blackened salmon and a sweet and spicy pineapple salsa. I make burrito bowls/salads all the time for lunch, but I never would have dreamt up this combination. But it's goooood. I mixed up the salsa earlier in the day, and the rest came together really quickly. It definitely has a kick, but Caroline ate it with no complaints. If you're sensitive to spice, then just decrease the cayenne to your liking. The original recipe called for mango salsa, but the ones at my grocery store were really under-ripe, so I improvised and used pineapple instead. I definitely want to make it with mango though, or maybe even a combo of mango and pineapple! This dinner is the epitome of summer eating for me - fast, low-maintenace, healthy, and super flavorful. Preheat the broiler. Line a baking sheet with foil and place the salmon on the foil. In a small bowl, combine all the spices with the oil to form a paste. Rub over the salmon, then broil the salmon until just cooked through, about 10 minutes. When it's cool enough to handle, break the salmon into bite-sized pieces, removing the skin as you go. Meanwhile, stir together the rice and beans, lime juice, and season with salt and pepper (this can be at room temperature or warm, so just heat according to your preference). To serve, divide the rice mixture evenly among bowls and top with salmon and pineapple salsa. Combine all the ingredients in a medium bowl. Season with salt to taste, and allow to sit at room temperature for at least 20 minutes before serving. This sounds fantastic! What a great combination of flavors! I think mango and pineapple would be great too! They do say that opposites attract...I know I would just love all these contradictions in a bowl! Yummm! I just went through my last pineapple, but this is going on my list to make. Oooh, YUM. I love salmon, and the caribbean jerk spices with the pineapple sounds deliciously juicy... i think my mouth is watering! Ooooh, love the idea of this bowl! I'm all for satisfying all of my cravings at once. Yum! I am really liking all of the flavours in this dish!